In recent times, downtown Akron has seen a rebirth. To write the next chapter for downtown, we'll need diverse voices and broad collaboration to generate ideas and a long-term plan. Take a walk with with mayoral candidate Dan Horrigan through downtown Akron. This walk will focus on the innerbelt project ideas for a vibrant downtown. Parking: Market/High St. parking deck, across from the Akron Art Museum. The deck is free after 6pm. Our downtown serves as Akron's principal employment center, and hub for arts and culture. In recent years, public and private investment have resulted in significant improvements. These improvements have become a magnet for families and businesses alike. It's time, however, to write the next chapter in the history of downtown Akron. To do that, I believe we'll need new ideas from a broad array of voices. 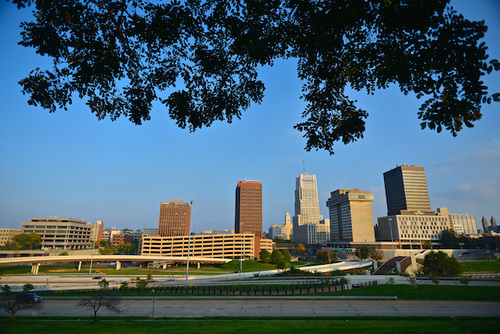 If Akron is to remain one of the best cities in the Midwest, we need a vibrant city core. This is an independently organized walk. Click here to create your own walk!